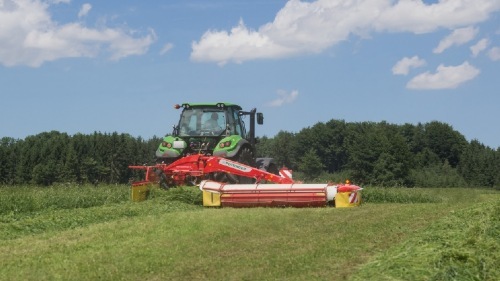 PÖTTINGER develops a revolution: Swath merging without conditioners The latest development from PÖTTINGER enables swaths to be merged for the first time without a conditioner: thanks to the new CROSS FLOW auger the swath is merged immediately after mowing. New Pöttinger Head of Sales - Manfred Höller joins the Sales Team As of December 2015, Manfred Höller is the new Head of Sales for Overseas, CIS and Southern Europe at Pöttinger. He takes over this sales division from the Vice President Sales & Marketing, Gregor Dietachmayr, who was standing in on an interim basis. 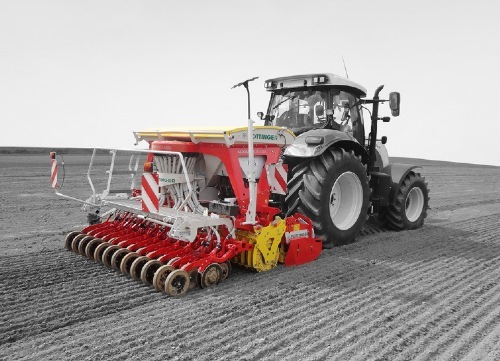 Pöttinger TEGOSEM – everything from a single source TEGOSEM - the Pöttinger catch crop seed drill - is used in combination with a Pöttinger stubble cultivator or disc harrow and enables soil preparation and catch crop seeding in a single pass. NOVACAT 352 V rear mower: compact, lightweight and best cutting quality Pöttinger has added to its NOVACAT rear mower range the NOVACAT 352 V with a working width of 3.52 m without conditioner. Thanks to the new, vertical transport position, the NOVACAT 352 V is ideal for tight cornering and narrow field entrances. SERVO 45 S: The plough for tough applications New to the SERVO family is an all-rounder for the toughest applications: the SERVO 45 S is strong, reliable and robust. The new TORRO COMBILINE loader wagon The TORRO stands out with its new COMBILINE design, not only in appearance, but also with the latest technology on-board. Pöttinger viser flaget i Danmark - Lars Andreasen er ny mand på salg Den bevidste satsning på internationaliseringen bærer en del af Pöttingers succes. For udover at have et alsidigt program af produktinnovationer er en kontinuerlig udbygning af det globale marked afgørende for at sikre væksten på et marked med svære betingelser. Pöttinger innovations for 2016 season Innovations make life easier for our customers. With this in mind, Pöttinger continues to develop new products. Cost-effectiveness, soil and crop protection, intelligent technology and attractive design are the key drivers behind the development of the machines. One for all: The new PRIMO Pöttinger has completely revised the series with the latest technology. TOP 842 C: The new big centre-swath rake for professionals Pöttinger has added the new TOP 842 C centre-swath rake to the top end of its successful range of centre-swath rakes. The new model guarantees high productivity, best ground tracking and excellent manoeuvrability. With a working width between 7.7 and 8.4 m, the TOP 842 C is the high-performance centre-swath rake for professionals. FARO: New models and highlights for the smoothest running mid-class rotor loader wagon It was with the FARO that Pöttinger introduced rotor technology featured on large loader wagons to the medium-sized loader wagon segment. Now farmers can choose between the classic FARO 3510 L/D, 4010 L, 4510 L/D, 5010 L and 8010 L loader wagons with a volume from 23 up to 46 m3 (DIN) and the FARO 4010 L/D COMBILINE multipurpose models. NOVACAT S10: The new high-flyer among the mower combinations Pöttinger sets new standards in mower technology in terms of performance and efficiency with the new 'fuel saver' NOVACAT S10. 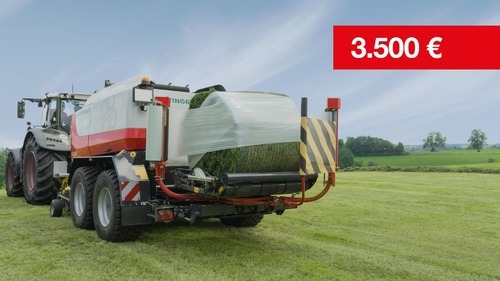 With a working width of 9.52 m, this mower combination offers the highest performance at a very low power requirement of only 130 hp. 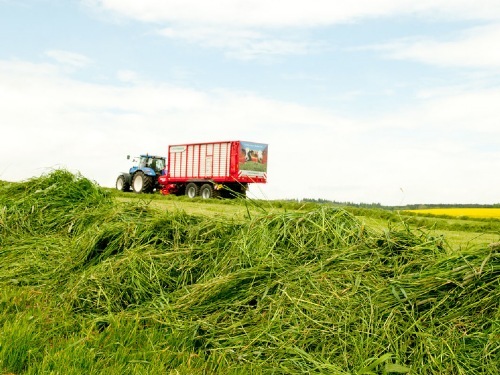 MULTITAST – 25 % less dirt in your forage Raking with the lowest possible disintegration loss and minimum contamination has highest priority at Pöttinger. To meet these demands Pöttinger designed a rake and developed the unique MULTITAST jockey wheel, which at the same time protects the sward. 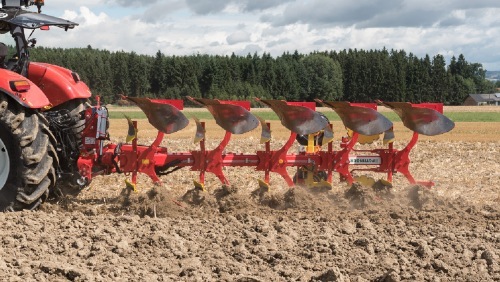 New LION 103 power harrow series Pöttinger has extended its range of LION power harrows: the new series is a "lightweight" compared to conventional power harrows and offers two versions - the LION 103 and the LION 103 CLASSIC. Awesome Pöttinger highlights: SIMA 2015 Innovations make life easier for our customers. With this in mind, Pöttinger continues to develop new products. Cost-effectiveness, soil and crop protection, intelligent technology and attractive design are the key drivers behind the development of our machines. 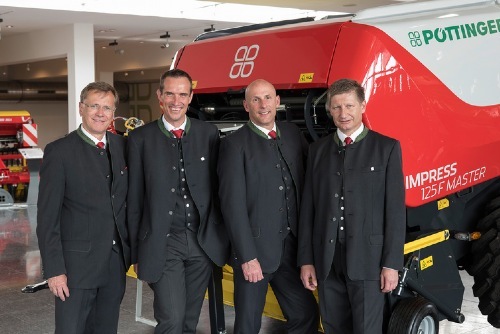 Pöttinger: New Vice President Sales & Marketing As of 01 December 2014, Gregor Dietachmayr takes over as Vice President Sales & Marketing at the Austrian agricultural machinery manufacturer Pöttinger. SYNKRO 3030 MULTILINE The new MULTILINE series from PÖTTINGER creates true all-rounders. 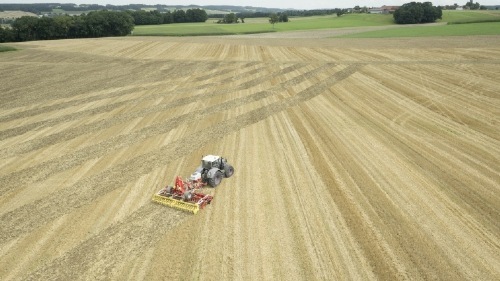 Last year, PÖTTINGER successfully combined the TERRADISC compact disc harrow with the seed drill. This year the same recipe for success has been applied to the SYNKRO stubble cultivator. Pöttinger innovations 2015 season Innovations make life easier for our customers. With this in mind, Pöttinger continues to develop new products. Cost-effectiveness, soil and crop protection, intelligent technology and attractive design are the key drivers behind the development of our machines..
KR Heinz Pöttinger: an industrialist with heart On the 24th of July 2014, Heinz Pöttinger (KR), senior boss of the agricultural machinery manufacturer of the same name, passed away in his 90th year. As an entrepreneurial personality, Heinz Pöttinger played a major part in shaping the history of the Austrian family-owned business. The company with its employees and family always had the focus of his attention. EUROPROFI combiline: The combo with the latest technology onboard In order to meet the different operating conditions of loader wagons and customers' individual requirements, Pöttinger now offers the EUROPROFI 4510, 5010 and 5510 as combined loader/transport wagons. 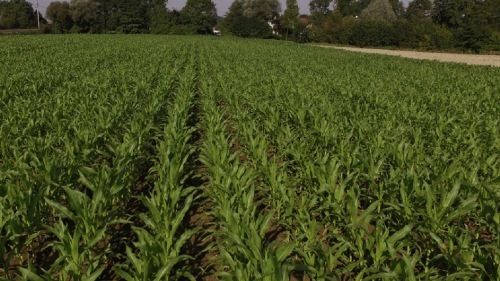 The ideal drill row spacing for maximum yield Some people swear by a row spacing of 12.5 cm, others insist on 15 or even 16.7 cm to produce maximum yield. Which is best? Pöttinger website: new design - new technology Pöttinger has completely revised and optimised its website. The agricultural technology professionals in Grieskirchen/Austria launch their new web pages, which are now even more user-friendly, intuitive and attractive. NOVACAT S12: In a class of its own. Lowest power requirement combined with highest performance in the new mower combination. The new EUROPROFI combiline loader wagon The combo with the latest technology onboard. Dr. Franz-Georg von Busse - New consultant for Pöttinger Starting September 2013 Dr. Franz-Georg von Busse has been working as a consultant for Gebr. Pöttinger GmbH. in Landsberg/Lech (GER). Acting on behalf of the board, he represents the company on various committees. 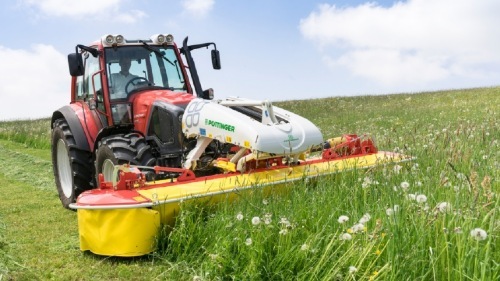 Pöttinger: News in grassland and soil Innovations make life easier for our customers. With this in mind, Pöttinger continues to develop new products. Cost-effectiveness, soil and crop protection, intelligent technology and attractive design are the key drivers behind the development of our machines. SYNKRO 1020 – the new stubble cultivator series Pöttinger has completely revised its two-gang stubble cultivator series to provide the ideal model for every soil situation. 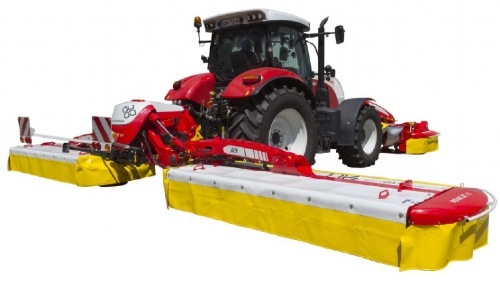 The SYNKRO 1020 duckfoot share cultivator series is available in working widths between 2.50 and 6 metres; models 4 metres and wider fold during transport. Pöttinger autocut goes from success to success A major milestone in the 50-year success story. Currently, more than half the loader wagons sold are equipped with autocut. 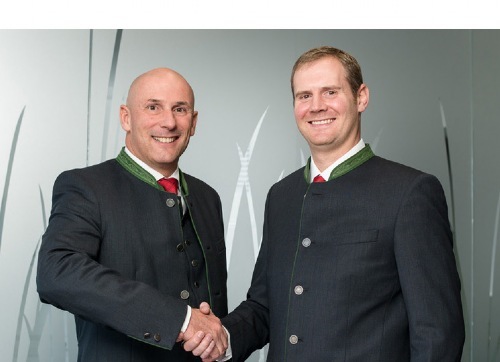 New Head of Finance and Controlling at Pöttinger In February 2013 Wolfgang Moser took over as head of accounting, finance and controlling at Pöttinger, the machinery manufacturer in Grieskirchen, Austria. A 50-year success story: Pöttinger and loader wagons Grassland technology has a long tradition at Pöttinger. The flagship of the extensive product range is the loader wagon. Back in 1963 Pöttinger was one of the pioneers in cutting edge development. Since then the company has been keeping loader wagon developments up-to-date for more than 50 years. Today, the Austrian agricultural machinery specialist is the worldwide market leader in this sector. 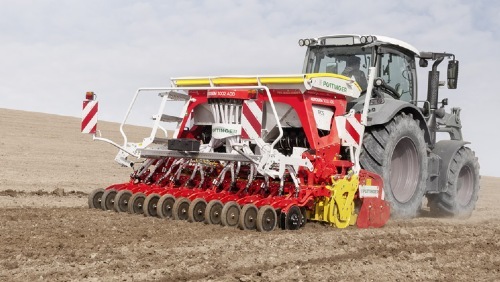 Pöttinger TERRADISC compact disc harrows - Performance and convenience up to 6 m wide The TERRADISC compact disc harrow is the specialist in shallow tillage. 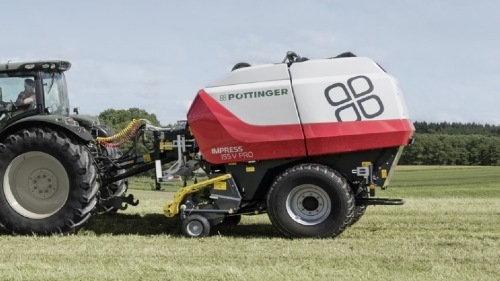 Pöttinger has revised this soil preparation all-rounder and is now introducing to the market the 1001 series as the new folding 3-point-mounted and trailed versions. 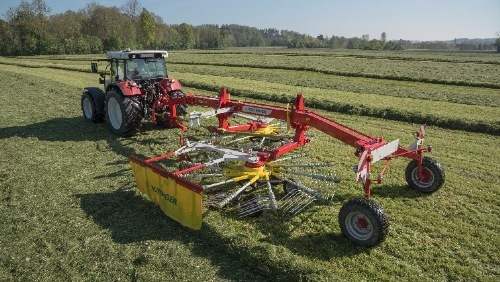 The new generation of compact disc harrow is now available with working widths between 3 m and 6 m.
Highest productivity – the TOP 812 pro rake Pöttinger raises the bar by adding the TOP 812 to the top end of its range of rakes. 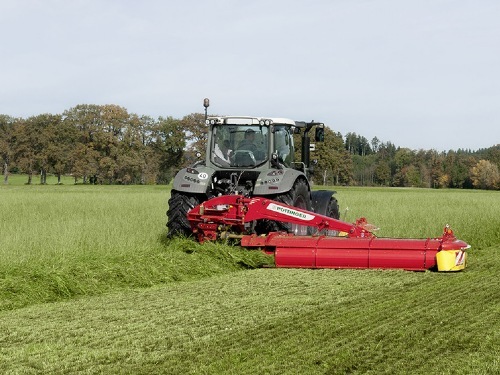 This new side-mounted rake meets high expectations in practice regarding raking quality, perfect ground adaptation and minimum forage contamination. 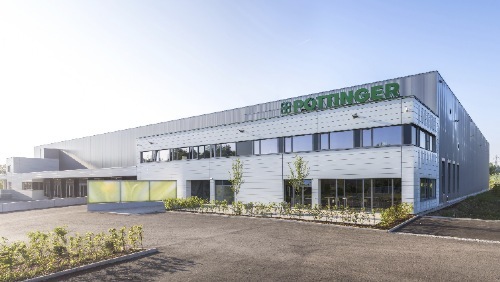 New sales structure in Belgium Pöttinger: All good things come in threes In rapid succession - following Ireland and Great Britain - Pöttinger has now founded a third sales subsidiary: Pöttinger Belgium, which will open for business at the beginning of November. 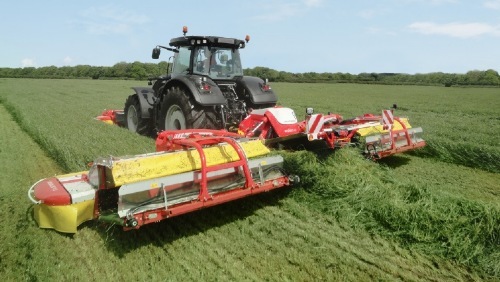 The new HIT 12.14 T – Excellence in tedding Larger farming operations, shorter harvesting windows and high expectations regarding forage quality are driving factors that mean grassland machines need to deliver more productivity at the same time as increasing working quality. 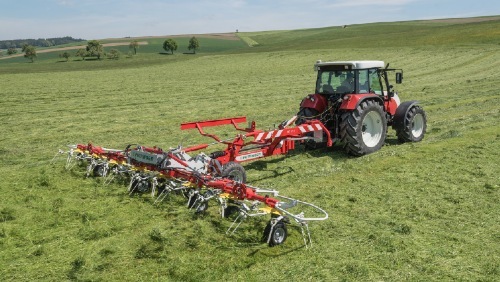 To meet these demands Pöttinger has added the trailed HIT 12.14 T tedder to the top end of its product range. Business report 2011/2012 Financial year 2011/12 is the best year for Pöttinger in the company's 140-year history: With an impressive increase of 19 percent to a turnover of around EUR 282 million, Pöttinger has achieved record growth. Pöttinger innovations 2013 season Innovations make life easier for our customers. With this in mind, Pöttinger continues to develop new products. Cost-effectiveness, soil and crop protection, intelligent technology and attractive design are the key drivers behind the development of our machines. Pöttinger’s green cloverleaf on the Emerald Isle The family-owned Austrian company Pöttinger is experiencing rapid international growth. Following the founding of its UK subsidiary - opening on September 1st - the agricultural machinery manufacturer has reorganised sales in Ireland (from August) by taking over the business of Traynors of Clonmel, its importer for many years. Pöttinger brings its international strength to Great Britain On the 1st September 2012 Pöttinger, one of the most well known producers of agricultural machinery in Europe, will establish a new subsidiary in Great Britain: Alois Pottinger UK Ltd.
New generation TERRADISC compact disc harrows The end of one harvest is the start of the next: harvest residues need to be worked in evenly so decomposition gets a head start. This mixture of straw and earth creates optimum conditions for soil life and consequently for the next harvest crop. 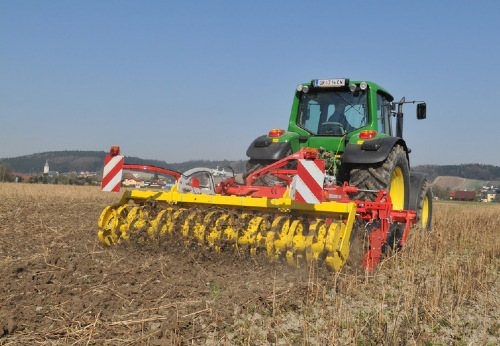 The specialist in shallow tillage is the TERRADISC compact disc harrow. 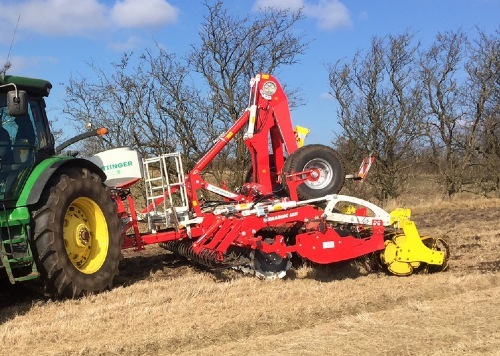 Pöttinger has revised this soil preparation all-rounder and is now introducing to the market the 1001 series as a 3-point-mounted rigid version. Pöttinger produces HITs hot off the line Pöttinger presented a wide range of new machines for the 2012 season at Agritechnica in Hannover. One of the highlights is a new addition to Pöttinger's tedder product range: the HIT 10.11 T. Series production of the new HIT giants started recently at the headquarters in Grieskirchen/Austria. A dedicated team of design engineers, product managers and manufacturing personnel were proud to present the new big tedder. SYNKRO stubble cultivators - perfect seedbed on frost-wilted crop The new generation of Pöttinger SYNKRO 1030 series stubble cultivators is ideal for both shallow and deep stubble cultivation and perfect for seedbed preparation in frost-wilted crops. For tractors of 110 hp upwards, the new SYNKROs offer numerous new technical solutions for even more efficient operation. Pöttinger cutter bars: Austrian engineering for perfect mowing quality Disc mowers have a long tradition at Pöttinger. NOVACAT disc mower cutter bars are developed and built at company headquarters in Grieskirchen - a quality product made entirely in Austria. 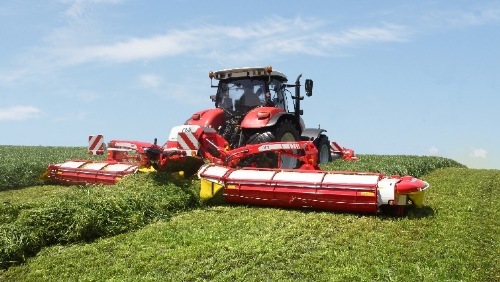 Pöttinger magic with rear-mounted mowers Pöttinger has some ace mowers up its sleeve: the NOVACAT rear-mounted 402 with a working width of 3.88 m and the 442 with 4.3 m.
The new tillage professionals: SYNKRO The new generation of Pöttinger SYNKRO cultivators are ideal for both shallow and deep stubble cultivation using tractors of 110 hp upwards. These new models offer numerous new technical solutions for even more efficient operation. 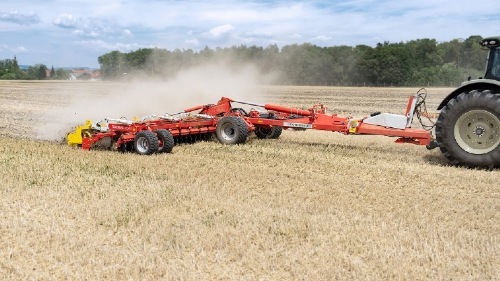 LION power harrows - The new 12-rotor model The LION 302.12 with 12 rotors and a working width of 3 metres is completely new to the Pöttinger range. TOP 722 - The flexible rake pro Pöttinger extends its range of side mounted rakes and presents a new generation with the TOP 722. 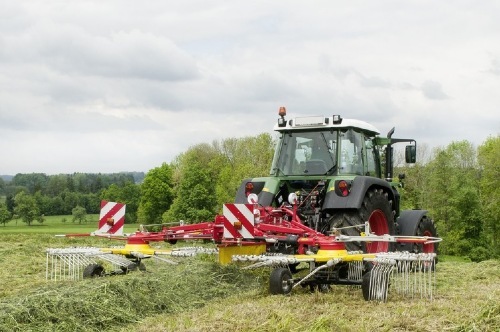 This new side-mounted rake meets high expectations in practice regarding raking quality, perfect ground following and minimum forage contamination. The new alpine fleet from Pöttinger Steep slopes, uneven terrain and huge differences in elevation - these are the operating conditions where Pöttinger's alpine equipment feels at home and delivers top performance. 140 years of more success with Pöttinger A long success story<br> At all began at a festival in Linz / Austria: Franz Pöttinger, a clockmaker, received a bronze medal for his forage cutting machine in 1871. He won this award exactly 140 years ago, the same year the company was founded. 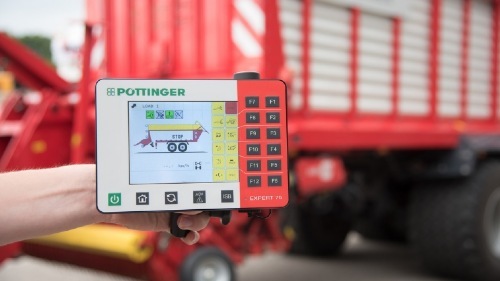 Pöttinger has been serving the agricultural technology industry ever since. In 1909 Alois Pöttinger took over from his father Franz and gave the company his name. Invitation to SIMA 2011 in Paris SIMA 2011 in Paris (20th – 24th February 2011). 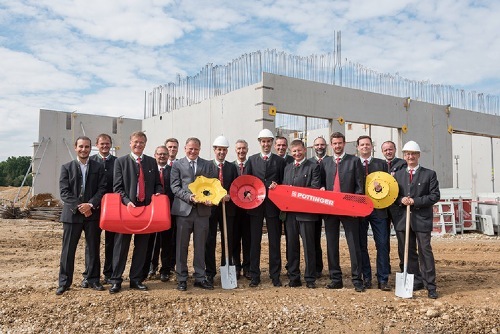 Martin Steinbichler – new Sales Division Manager New Pöttinger Sales Division Manager Austria & Germany Pöttinger begins its 140th anniversary year with a new development in sales: Martin Steinbichler takes over management of sales in Austria and Germany. Plenty of space for the swath: TOP 852 C s-line Pöttinger has given its attention to extreme mobility and perfect ground hugging. 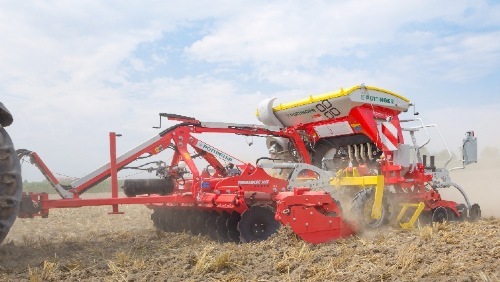 With the new TOP 852 C s-line Pöttinger has developed a double windrower with central swath placement that offers plenty of space for the swath: a rotor lifting system with the axle inside the arc of the rotor (steered axle), provides real "jet effect" for a ground clearance of around 60 cm. Pöttinger’s NOVACAT 402 / 442 rear-mounted mowers New to the NOVACAT family of rear mowers: the 402 and 442 with working widths of 3.88 m and 4.3 m respectively. Another double award for Pöttinger innovations Pöttinger wins two awards at the Agraria fair in Wels, one of the largest agricultural shows in Austria. A Gold "Ag-Fox" for "autocut" and a Silver "Ag-fox" for the VITASEM metering system. Well-equipped for the upswing New Pöttinger Global Sales Manager sets the sails From 1st August 2010 Dr. Martin Schädle will take over global sales management of agricultural machinery at Pöttinger. Customer proximity and innovative sales structures and lines of communications are pillars that carry Pöttinger's success. The current ten sales subsidiaries present an enormous challenge for the sales management team. The new global sales manager plans to coordinate and create future growth. 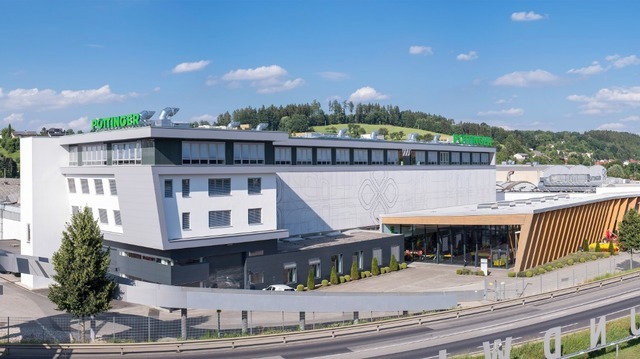 'Love is in the air' with top politicians at Pöttinger A brass and choral 'Windsingspiel' at the agricultural engineering centre Pöttinger supports the annual Upper Austrian Exhibition by making its modern customer centre and display area available for a number of special events. From 13 to 15 May the agricultural manufacturer was host to cultural patrons and top politicians from the town council and provincial government: Heinz Pöttinger welcomed the mayor of Grieskirchen, Maria Pachner, and the governor of Upper Austria, Josef Pühringer, as well as many other VIP visitors. The latest testing technology for highest quality machines The TIZ technology and testing centre is the heart of the Pöttinger quality assurance system. For more that five years now, machines have been tested here for their quality and suitability for field conditions. This is where research, development and application come face to face. The testing centre is one of the most modern worldwide for agriculture and has an excellent reputation. Many international manufacturers have their products tested at Pöttinger, including Airbus Industries and many famous car manufacturers. Pöttinger wins "Best Innovator 2009" award On March 16, 2010 the Austrian Federal Minister, Reinhold Mitterlehner, presented the Best Innovator 2009 award at Haus der Industrie in Vienna / Austria. The initiator of the award is the well-known consulting firm A.T. Kearney. Pöttinger won the title in the "Innovative Processes" category. New generation in Pöttinger Development Management Outstanding innovations with new technical developments provided the cornerstone for numerous awards won by Pöttinger at international trade fairs in the autumn of 2009. The Development Department managed by Wolfgang Schremmer made a significant contribution. In April, the Head of Development for many years will enter well-earned retirement. Dr. Markus Baldinger, a Pöttinger employee, will ensure the continued success of this department. New high-end generation TERRASEM: R3, R4 and C4 The new generation of TERRASEM R3, R4 and C4 seed drills handles the tillage, packing and seeding stages in a single pass at working widths of 9.8 and 13.1 feet (3 and 4 metres). Everyone needs agriculture Sufficient and high-quality nutrition is a key challenge for both farmers and agricultural technology. In the 1950s a farmer provided for ten people – today that figure has climbed to around 150. Providing energy has to be added to this – a requirement where agriculture can likewise make a valuable contribution. Pöttinger wins multiple awards at Agritechnica At the world's largest agricultural trade show - Agritechnica in Hanover – Pöttinger scooped up a number of awards and medals. 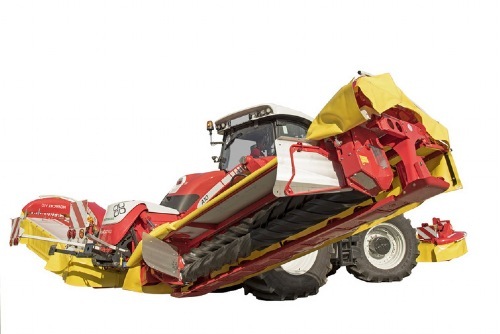 This clearly confirms the innovative power of the agricultural machinery manufacturer from Grieskirchen/Austria, and the durability and performance of their products. Loader wagons received the most accolades. Pöttinger innovations 2010 season Innovations make life easier for our customers. With this in mind, Pöttinger continues to develop new products. Cost-effectiveness, soil and crop protection, intelligent technology and attractive design are the key drivers behind the development of our machines. 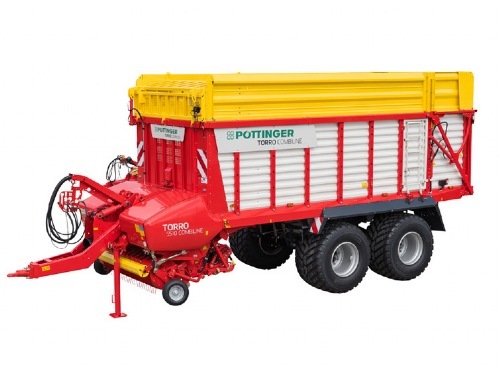 Austria News for the season 2009/2010 Pöttinger continues to develop its product range. Cost-effectiveness, reducing energy costs, soil and crop protection, plus intelligent technology are the key criteria in the development of our machines. 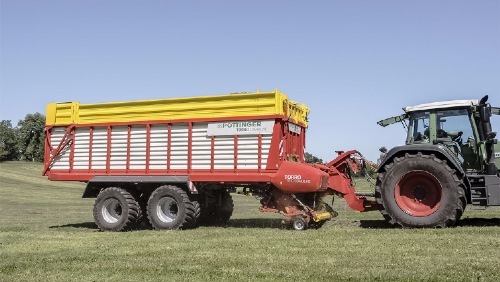 Take care of your soil - Pöttinger 8-wheel chassis Larger farms need more powerful and higher performance machinery. Heavier machines and high wheel pressures further add to the problem of ground compression. Tackling the issue "soil protection" is essential for the future and continues to gain in significance. First Pöttinger JUMBO 10000 lands in Austria NAWARO Energie Betrieb GmbH, who operates three biomass heating power stations in the Waldviertel / Lower Austria, made it all possible: The first Pöttinger JUMBO 10000 starts operation in Austria. 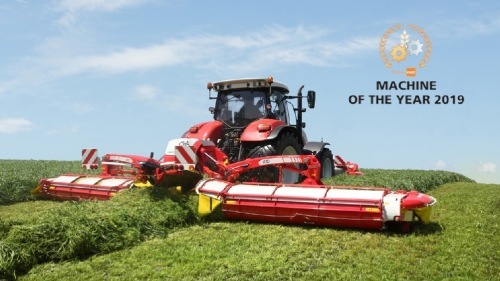 Pöttinger windrowers – it all started with the The agricultural machinery specialist Pöttinger has been recognised for decades as the specialist in Alpine technology. In addition to a wide range of mowers and tedders, the Austrian manufacturer also supplies a comprehensive line of windrowers. The cornerstone of this technology was laid at the end of the 50s with the development of the Pöttinger conveyor-type "hay rake". Take it to the top – NOVAALPIN Stability combined with a lightweight construction, these are the key features of the Pöttinger Alpin range of mowers. The front-mounted NOVAALPIN mower has been designed with working widths of 2.20 and 2.62 metres especially for working in the Alps . Machine highlights Pöttinger continues to develop its product range. Cost-effectiveness, reducing energy costs, soil and crop protection, plus intelligent technology are the key criteria in the development of our machines. Personnel changes in Sales and Marketing Pöttinger's turnover has more than doubled in the last five years. A new structure has been created within the company to support ongoing success. Pöttinger Austria - What’s new for 2007/2008 Innovations make life easier for our customers. With this in mind, Pöttinger continues to develop new products. Cost-effectiveness, soil and crop protection, intelligent technology and attractive design are the key drivers for the development of our machines. Heinz Pöttinger Senior receives award Kommerzialrat Heinz Pöttinger, Senior Managing Director and Chairman of the Pöttinger board of directors, has been awarded the Crystal Pegasus 2007 for his life's work. Upper Austria's top business award, hosted by the OÖNachrichten newspaper, was presented to the 82-year-old Senior Managing Director during a ceremony at the Brucknerhaus concert hall in Linz. Get a success story with Pöttinger At Agromek 2007 Pöttinger Denmark will handover machine number 1000 sold on the Danish market since the start up in April 2000. Få en succeshistorie hos Pöttinger På Agromek 2007 overdrager Pöttinger Danmark ordre nummer 1.000 på det danske marked siden opstarten i april 2000. Five giants treading lightly Contractor Diego Campari relies on JUMBO Tridem-Power from Pöttinger. 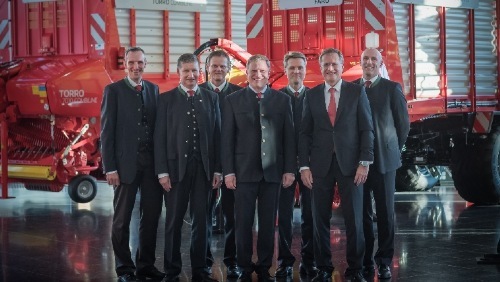 Europe's most modern loader wagon assembly line The Austrian agricultural engineering firm modernises its loader wagon assembly line to meet with increasing demand and product range versatility. 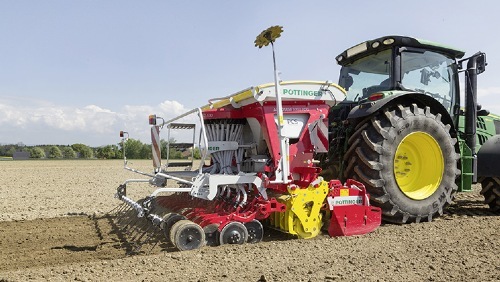 Compact and effective Pöttinger adds more cultivation to its product range. 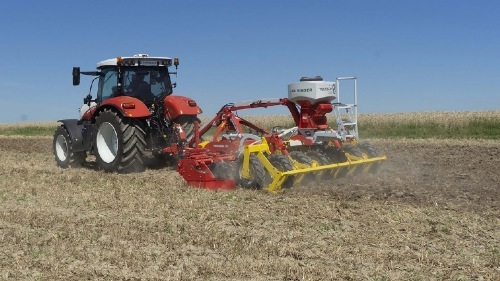 The new compact disc harrow TERRADISC is designed specifically for stubble cultivation and seedbed preparation. Klaus Pöttinger New Vice President Klaus Pöttinger (46) has been elected as the new Vice President of the Federation of Austrian Industry. Ace treatment for ground protection Pöttinger offers a new 8-wheel chassis to minimise ground compression on loader wagons. Keck, a German contractor, reports on his experience. 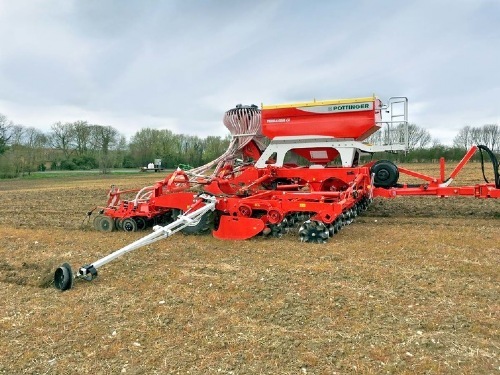 VITASEM A - Implement-mounted seed drills Harrow-mounted seed drills can be fitted and removed quickly and easily. 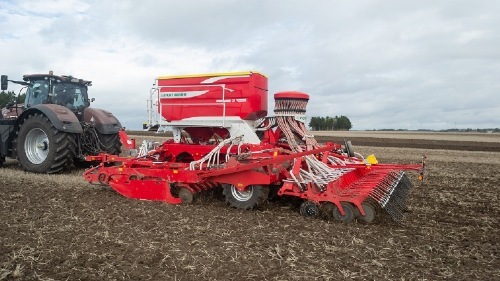 Pöttinger - power harrows with new transmission Latest developments on power harrows. All LION power harrows will feature a new transmission in future.